Any other week, a review of the reissue of the Singles soundtrack would open with a nod to the ‘90s, maybe something about pagers or Friends or Cameron Crowe’s streak of decidedly average movies that delighted white people all over America. And really, that’s the review I wish I could write. But less than 48 hours before the two CD deluxe edition was to hit shelves and whatever passes for shelves in the streaming/downloading world, Chris Cornelldied. So, regardless of whatever trite plaid-flannel-colored nostalgia trip Legacy Recordings might have had in mind when they compiled it, the Singles reissue will forever serve as Cornell’s memorial. Tragic? Yes. Appropriate? Also yes. 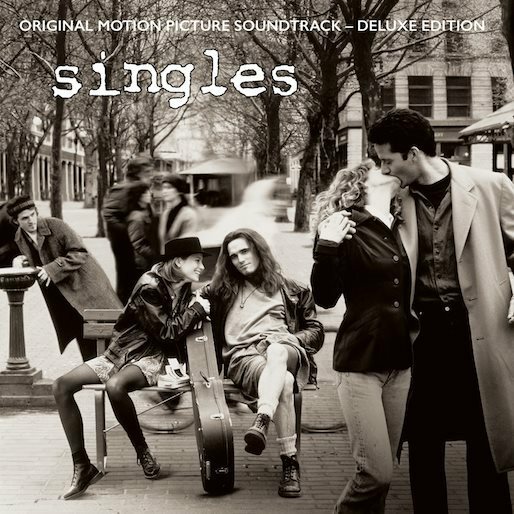 Singles hit theaters just as its major elements—Generation X, grunge, Seattle—dominated popular media. The young bands on its soundtrack, like the young urbanites onscreen, promised to rewrite popular culture into something more earnest and true than the shiny but hollow ‘80s had offered. And if that meant celebrating anger or going a little darker now and then, well, the honesty was plenty worth it. When those of us facing a ‘90s adulthood listened to the Singles soundtrack, we heard possibility. The prolific, versatile Cornell captured on the soundtrack’s deluxe edition personifies that same sense of possibility. Evidently, he provided Crowe with a massive amount of material: solo and Soundgarden songs, demos, incidental music, instrumentals. His first official solo track, “Seasons” appears on the original soundtrack, as does Soundgarden’s “Birth Ritual.” He wrote nearly half of the songs on the second disc, including the four tracks that, with “Seasons,” make up the much-sought after Poncier EP, the fake demo that the film’s Cliff Poncier (Matt Dillon) was selling after his band broke up. If people imagined Seattle as a city full of musical wizards sitting among piles of excellent songs, Cornell’s writing for Singles was all the confirmation they’d need. Then, there’s his voice. God, that voice could do anything, it seemed. Cornell could wail like an air raid siren, and the Soundgarden material here (a studio version of “Birth Ritual” and a live take used in the film; both thunderous, both essential) reveals him at his most formidable. And while that shriek cements his reputation as one of the best ever rock singers, Cornell’s more subdued moments were often even more powerful. On “Seasons,” he sounds wholly vulnerable, a coyote’s woeful howl silhouetted against a simple acoustic guitar. Poncier’s somber “Nowhere But You” similarly aches, the lonely vocals multiplied by canyon-size reverb, while “Flutter Girl” hints at the gauzy, melancholy psychedelia he’d explore in subsequent solo work. The rest of this collection features a who’s-who of Seattle and alternative icons all represented by compelling, forward-leaning tunes. “Breath” proves that, at one point, Pearl Jam wrote truly engrossing songs. Replacements frontman Paul Westerberg supplied his first solo material in the form of two perfect pop gems: “Dyslexic Heart” and “Waiting For Somebody.” Mudhoney’s “Overblown” (disc two offers a demo that easily eclipses the original) sneers at their hometown’s sudden popularity. Songs from Truly (produced by the Posies’ Jon Auer) and Blood Circus (featured in the film, but not on the original soundtrack) demonstrate that for all of that hype, Seattle had a deep well of overlooked artists. There’s a way that memories of our youth can betray us 25 years on. A peerless hometown pizzeria probably doesn’t serve the best slice in America. Those magical first kisses shared in the woods probably didn’t come from true love. That rollercoaster never broke ten miles an hour. But occasionally, it turns out that we remember everything perfectly; the pizza is heavenly, the kiss made you dizzy, the rollercoaster left you breathless and more alert than you’ve ever been. And so it is with Singles, and Seattle, and Chris Cornell. If we remember that cultural moment as uniquely exciting, full of promise, that’s because it was uniquely exciting and full of promise. The songs on this soundtrack document a community of artists, as they picked up speed creatively. Cornell stood out then for his talent and work ethic and abundant artistic energy. And now that he’s gone, and all we’ve got are these songs, he can serve as a symbol of a cultural moment defined by hope and powered by imagination.